↑ "The World Factbook". Central Intelligence Agency (USA). 2009-11-27. अभिगमन तिथि 2010-01-01. ↑ Nolan, William. 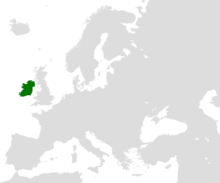 "Geography of Ireland". आयरलैण्ड का सरकार. अभिगमन तिथि 2009-11-11.